Clair W. Weekley age 89, of Ashland, died Friday August 30, 2013 at Hospice of North Central Ohio. He was born January 30, 1924 in Coshocton County, the son of Robert T. and Daisy (Howell) Weekly. Mr. Weekley had been a resident of Ashland most of his life. He had been employed with Borg Warner in Wooster and later he was employed with General Motors as a tool maker for over 30 years before retiring. 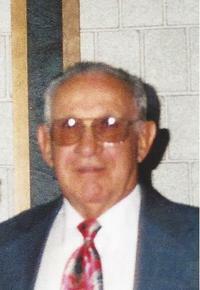 Mr. Weekley was a member of the Paradise Hill United Methodist Church and was an avid bowler. On January 2, 1977 Clair married Margery (Fulk) Portner- Weekley who survives. Also surviving are his children, Robert Weekley of North Carolina, Gary Weekley of North Carolina, David Weekley of Florida, and Terri Johnson of Tennessee; his step children, Larry Portner of Ashland, James Portner of Ashland, Linda Cooke of Florida, and Sheryl Westervelt of Warren, Ohio; 17 grandchildren; 28 great grandchildren; his sisters, Audrey (Jane) Hines of Wooster, and Zona Smith of Florida; along with his sisters in-law, Carol Weekley and Sue Weekley. Clair was preceded in death by his parents; his first wife, Myrtle Weekley in 1976; brothers, Kenneth Weekley, Louie Weekley, Bernard B.R. Franklin; his sister, Ruthie Weekley; Brothers in- law, Paul Hines and George Smith; and a son in- law, Jerry Cooke. Funeral Services will be held at 11:00 A.M. on Thursday September 5, 2013 at the Paradise Hill United Methodist Church with Pastor Janet Chilcote officiating. Burial will follow at Ashland County Memorial Park. Friends may visit with the family one hour prior to the service at the church. The family suggests memorial contributions may be made to either the Paradise Hill United Methodist Church 1491 St. Rte. 603 Ashland, Ohio 44805 or Hospice of North Central Ohio 1050 Dauch Drive Ashland, Ohio 44805.